CBC’s Canada Writes…don’t miss the Dec. 18, 2012 challenge! If you’re a Dr Seuss fan, use twitter, and like a challenge, you could win an i-Pad from CBC’s Canada Writes program. For the past week Canada Writes has been celebrating Seusstivus – their homage to the wonderful ways that children’s book authors capture a child’s imagination. Their next Twitter writing challenge will be taking place tomorrow (Tuesday, December 18) from 9 a.m. to 5 p.m. EST. And they want you to participate! They won’t be revealing the exact theme of the challenge until tomorrow morning, but it has something to do with the holidays, so get out the eggnog and put on your thinking caps. The grand prize is an iPod Touch! They’’ve partnered with the Canadian Society of Children’s Authors, Illustrators, and Performers (CANSCAIP) for the challenge. CANSCAIP members will be reading your Tweets and interacting with you throughout the day. They’ll also be giving away amazing books by Canadian Children’s authors every hour. The judge for the challenge is the CBC’s Jonathan Goldstein (of Wiretap fame). Jonathan will be playing the role of the Grinch in the upcoming CBC/McGill production of “How the Grinch Stole Christmas!” broadcast on CBC Radio One on Christmas Day. So, be sure to visit www.cbc.ca/canadawrites tomorrow morning to find out the details of the challenge. Also, don’t forget that the CBC’s Creative Nonfiction Competition is now on. One lucky winner will receive $6,000 from the Canada Council for the Arts, publication in enRoute magazine, and a two-week residency at The Banff Centre. The deadline for the competition is February 1st 2013. So think about using your upcoming holidays to tell your story. 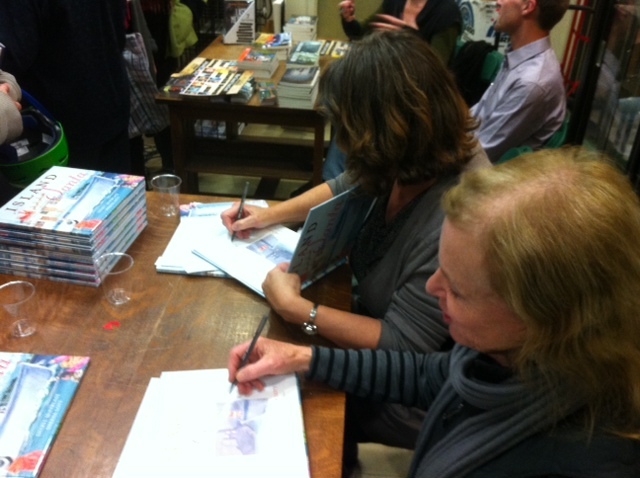 Last night’s launch at Bolen’s Books was wonderful. A full house. Of course, it was not without it’s quirks…the mall where Bolen’s is located is under construction. Just as we were about to start, we were given a warning that a building evacuation drill was about to start. Fortunately, we were given an exemption, so carried on. Sheen Lott, the illustrator of Island Santa, and I were up first. I talked a little bit about the story behind the book, and the inspiration behind the story. 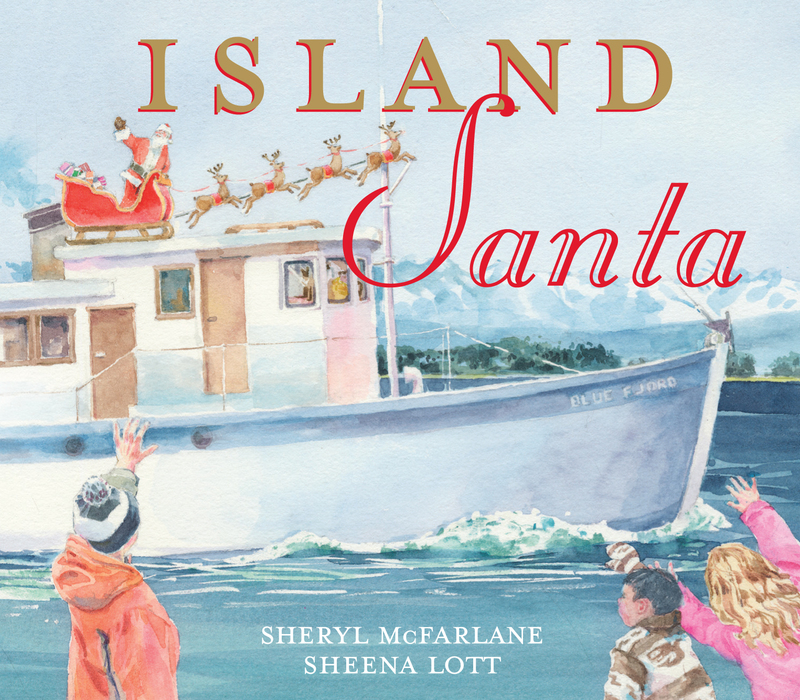 I wanted everyone to know that the proceeds for Island Santa will go to support Jeneece Place, a home away from home for Island families who need to leave their communities to get medical services for their children. I was able to thank David Holmes, a veteran sea rescue coxswain who helped me chart the course that course of Santa’s boat at the draft stage of the book. While I’m familiar with the local water’s, it’s from a kayaker’s point of view. David kindly helped me calculate realistic time lines for a boat of the size of the Blue Fijord (Santa’s boat prior to it’s sinking in 2006). After I read a few pages, Sheena did the most succinct explanation of the illustration process I’ve ever heard. Our mini-presentation was followed by short talks by five other Orca authors. It was a lovely evening. Get a jump on your Christmas list with autographed books! 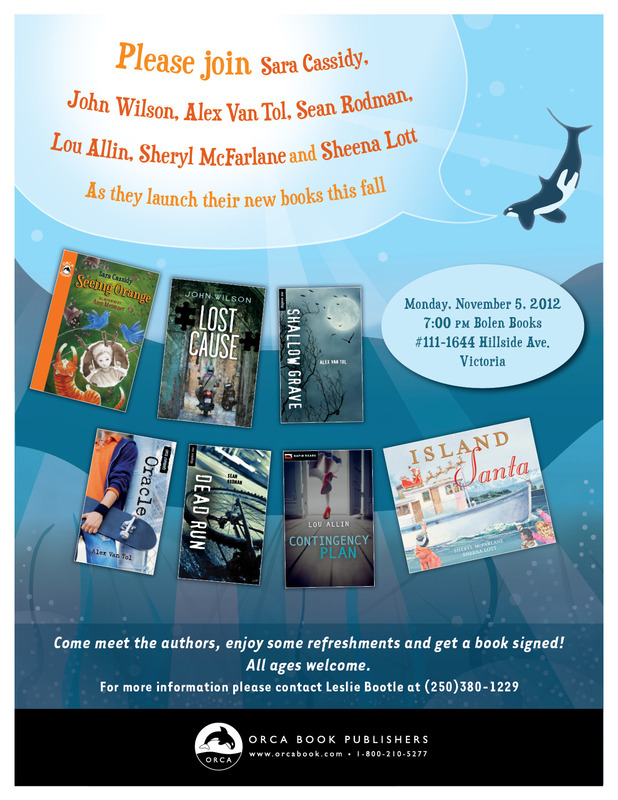 Join us for the launch of seven new books for kids and teens at Bolen’s Books on Monday Nov. 5 at 7PM. Pamela is the author of four collections of poetry, two verse novels, and a novel and picture book for children. Her most recent verse novel, I’ll Be Watching (2011), was shortlisted for the 2012 Bolen Books Children’s Book Prize. Pamela’s first verse novel, The Crazy Man, won the 2005 Governor General’s Award, the TD Canadian Children’s Literature Award, the Canadian Library Association Book of the Year for Children Award, and other accolades. Pamela lives in North Saanich with her family and a menagerie of rescued horses, dogs, and cats, including a formerly wild mustang.